Add lime juice, garlic, 1 handful of cilantro leaves and salt and pepper to taste to the black beans in a dish and stir. Set aside. 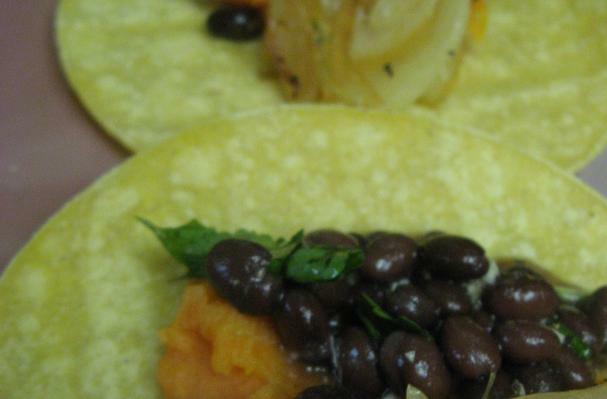 Scrub sweet potatoes and wrap them in foil, bake them in the oven for approximately 25 min. Once they are fork tender, remove them from the oven and cool. Once cool cut them in half and scoop out the squash from the skins and place into a bowl. Add sour cream and mash sweet potatoes with a fork. Over medium high heat add butter and olive oil to a medium sauté pan until butter is melted. Add onions, salt and pepper and sate for 10 minutes, sauté until onions are limp, reduce heat to low and continue cooking the onions until they break down further and become caramelized, approximately another 10 minutes. Remove onions from heat and onto a plate. Meanwhile, in a medium saucepan over high heat add olive oil, diced onion, poblanos, Serranos and garlic. Add a pinch of salt and pepper and sauté for 7 minutes. Adjust heat to low, add cinnamon and sauce, cook for another 15 minutes. Allow to simmer while you prepare tortillas. Over medium high heat, add canola 1 small splash of canola to a large sauté pan and fry two corn tortillas, just so they are soft and not soaking in oil, place them onto a paper towel-lined plate. Repeat until all tortillas are fried. Or, for a healthier alternative, simply microwave the tortillas until soft. To assemble enchiladas, scoop a spoonful of the sweet potato mixture into each tortilla, then add 1 spoonful of black beans and a tablespoon of caramelized onions. Place tortillas into a 13x9 inch pan so they are rolled facing down. Pour sauce over all the tortillas and sprinkle with cheese. Bake for 15 minutes. Garnish with cilantro leaves.